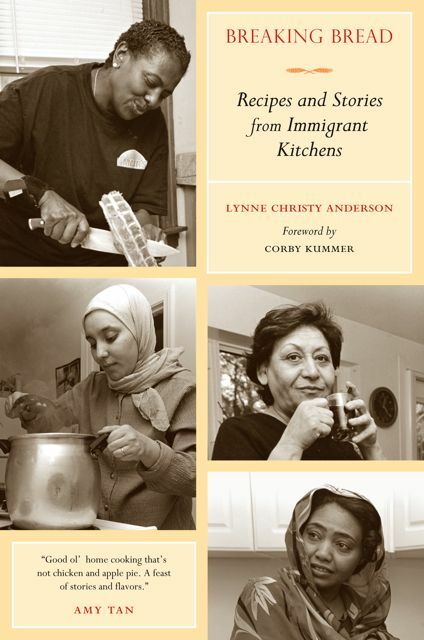 Breaking Bread: Recipes and Stories from Immigrant Kitchens is a collection of interviews, recipes, and photographs exploring the symbolic role of food in the lives of 25 immigrant cooks and their families. Through stories of hand-rolled pasta and homemade chutney, local markets and backyard gardens, and wild mushrooms and foraged grape leaves, this book recounts in loving detail the memories, recipes, and culinary traditions of people who have come to the United States from around the world. Chef and teacher Lynne Anderson has gone into immigrant kitchens and discovered the power of food to recall a lost world for those who have left much behind. The enticing, easy-to-prepare recipes feature specialties like Greek dolmades, Filipino adobo, Brazilian peixada, and Sudanese mulukhiyah. Together with Robin Radin's beautiful photographs, these stories and recipes will inspire cooks of all levels to explore new traditions while perhaps rediscovering their own culinary roots.